composting is a great option to handle all the valuable Black Gold the cows give back to us! Notice the STEAM coming up out of the pile? An active compost pile should register 135 – 160 degrees F on a thermometer! We improved the breakdown of material by using a forklift attachment to spear into the pile and lift up, aerating the pile. More air plus some more water made all the difference! Bagged and ready to use! Have you ever wondered what you would do with all that cow manure? Many of us have gardens and areas where we can constantly use more nutrients and compost. But for those with excess manure, there is another option out there! Last October (2010), the Pennsylvania Association for Sustainable Agriculture offered a class called: All About Biogas: Renewable Energy Workshop for Beginners. 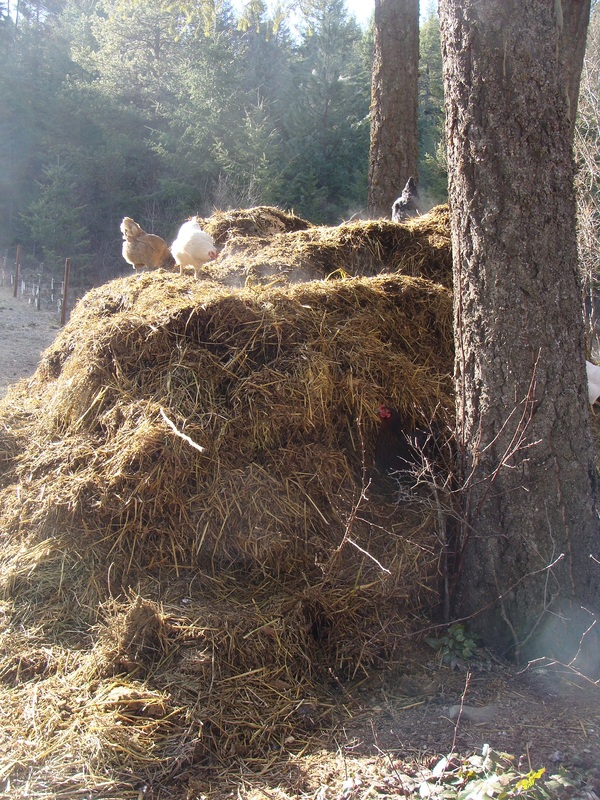 Biogas is a process whereby the methane in manure is collected through a composting process. This gas can be used like other gases for fuel purposes, such as to heat your home or warm your food! If you can reuse that methane from the cow in another heat process before the methane is sent off into the atmosphere, then you can help reduce pollution in the air! Our answer: No, we need every drop of manure for compost to fertilize our gardens and fields, so we do not have enough for extras. I posted this information because some people are interested in it, and I’ve heard some people have successfully used home-made models! 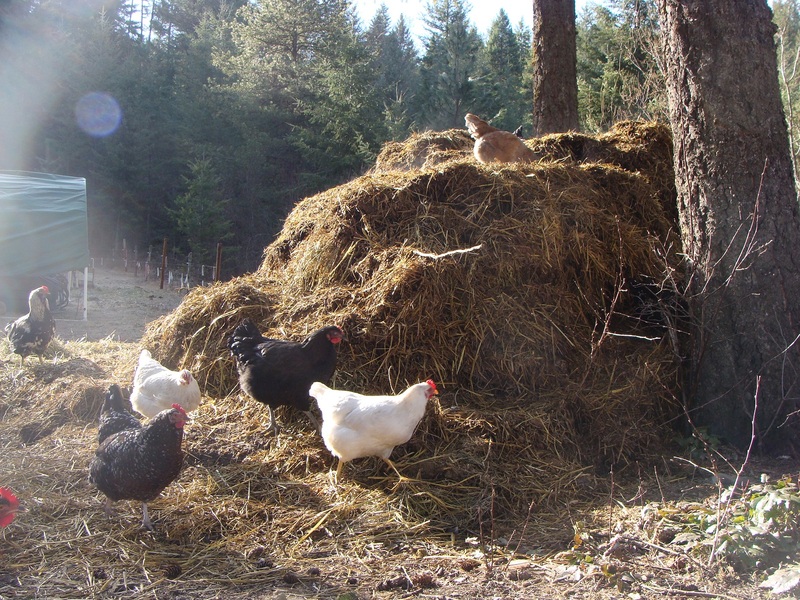 Our compost pile stays toasty warm during the winter, so we use that “energy” by letting the chickens scratch around in it all winter. 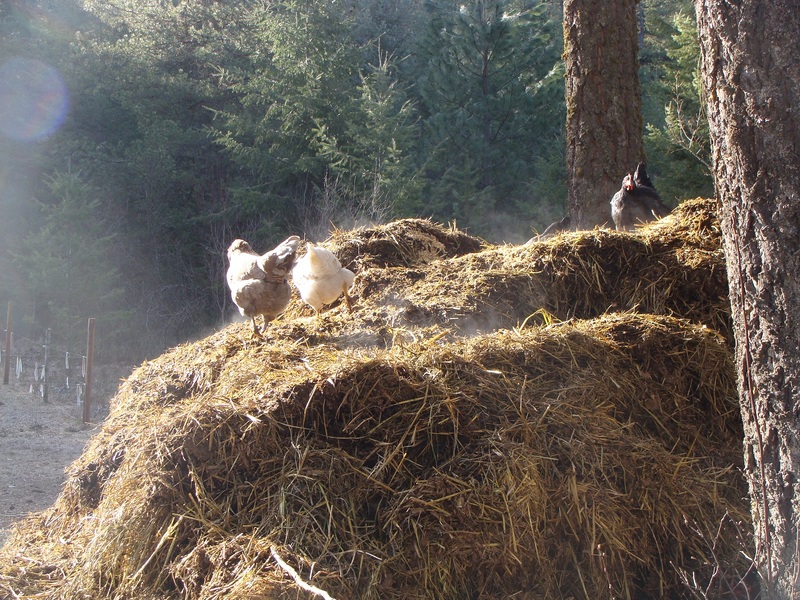 It’s near their coop and so when they’re outside on wintery days, the compost pile is a nice warm place to let them be chickens and scratch around for goodies!